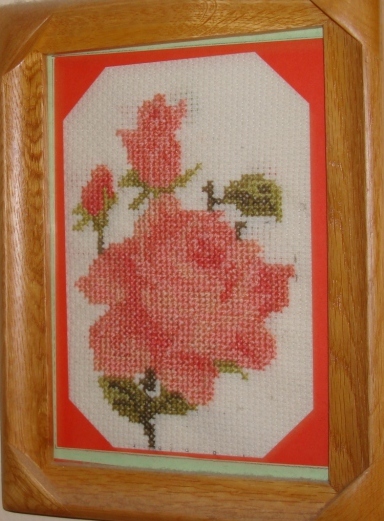 The second frame , the roses are done in varying shades of peach. This is a big rose with two small buds. The big rose pattern was taken from a flower bouquet .the book had this bouquet pattern for a cushion cover and the buds were chosen from other small rose patterns. It was interesting to work the placement of the roses within the frame. Here also I tried[unsuccessfully, ofcourse!] fixing a medium red colour paper around the work.the next one is a red rose.